Protect your PCR reactions from contamination inside a PCR Workstation or dead air box from Expedeon. 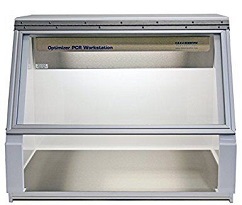 Available in sizes from 30” to 48” wide, these PCR Workstations are available in a variety of configurations to suit your research requirements. Choose from stainless steel or black formica work surfaces, fluorescent and UV light(s), as well as single or double door closures. A safety interlock automatically shuts off UV light when hood is opened. A dead air box protects against airborne or cross-contamination by limiting the exposure of the experiment to the environment of the open lab. UV irradiation before experimentation protects the work area by blocking the replication of contaminating DNA sequences. 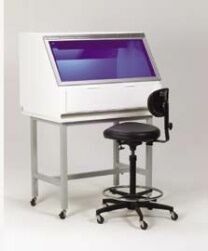 With ergonomic designs and easy access, our PCR workstations will help facilitate clean and consistent PCR reactions. Hinged tempered glass provides an excellent face shield while integral timers and duplex outlets ensure accuracy, convenience, and safety for all lab technicians. Optimizer PCR Workstation provides protection against contamination of sensitive PCR amplification reactions. White-top, steel frame powder-coated table with foot rest and leveling feet. Accessory for PCR Workstation P-030-02 or P-030-202.